The Kansai region is extremely diverse because you have countless places to visit and enjoy the uniqueness of Japan in this amazing prefecture. Therefore, it is nigh impossible to pick one special gem because you have so many. Despite this, if you seek to fuse nature, history, culture, stunning scenery, a religious vibe that still shines strongly – and other amazing realities – then Koyasan must come high on the places to visit in Kansai. Of course, Kyoto and Nara are internationally famous for exquisite religious places of worship, high culture, architecture, amazing gardens, and in Kyoto you have unique traits like geisha. 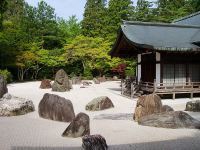 However, Koyasan in Wakayama is a gem in its own right because the power of Shingon Buddhism remains vibrant and likewise the old world ticks sharply throughout this part of Japan. The mountainous aspect of Koyasan means that you can feel close to the mystery of life. This is the beauty of Koyasan because you have so many Buddhist temples to visit alongside enjoying sublime nature. On top of this, the richness of culture is visible in all directions and the same applies to exquisite architecture in relation to religion, history and culture. Therefore, Koyasan is about the deeper meaning of life and the simple things that are often taken for granted. Not surprisingly, nature comes alive while images of the Buddha seem so natural in this adorable part of Japan. Gardens and art also fuses freely within architecture and religion therefore everything seems so natural. Non-Buddhists and Buddhists alike will feel at home in Koyasan because “the bigger picture” and the splendor of humanity can be seen visually. God’s Eden may be tainted by the failure of humanity according to the Abrahamic faiths. However, hidden away in all nations are rare treasures and this certainly applies to Koyasan in the land of the rising sun. 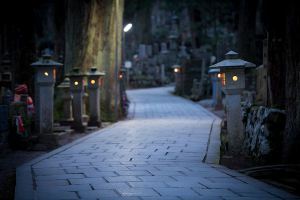 The non-religious may believe that God is an illusion and this may be so; however, in places like Koyasan you can feel “a magical atmosphere.” This is based on the “old world” surviving within “modernity” but preserved by its rich culture and spirituality. Kukai (774-835), who became known as Kobo Daishi, established the first monastery in the ninth century on mount Koya (Koya-san). The Shingon sect of Buddhism had a different thought pattern within the many schools of Buddhism. After all, Kukai believed that enlightenment could be attained in one lifetime. 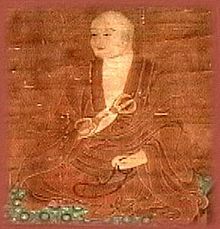 Kukai was a searcher therefore in China he studied Esoteric Buddhism. Initially, Kukai prayed for peace and prosperity because he could not find inner-peace within city life. Therefore, he searched for a place where he could meditate and become even more spiritual. When Kukai saw the stunning nature of Koyasan it was clear to him that he had found “his Eden.” The mountains meant that he was cut off from everyday city life in this period. On top of this, the sublime beauty of nature added to the mysterious feel of Koyasan to Kukai. In modern Japan the old world still survives in places like Koyasan, Kyoto and Nara. Therefore, if you want to feel the richness of culture, visit amazing architecture, enjoy stunning scenery, feel the souls of the dead within mysterious graveyards, feel the allure of history and art – and understand the old world of Buddhism in Japan – then a visit to Koyasan is a must.